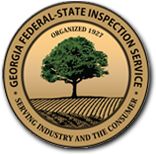 Georgia Federal-State Inspection Service began serving the Agriculture Industry in 1927. We are located at 951 Pecan Grove Drive across from the airport in Albany, Georgia. GA FSIS provides an honest, impartial, efficient and accurate service to the members of the Agricultural Industry. We inspect over 35 commodities, including peanuts, miscellaneous fruits and vegetables, and pecans. The use of the Inspection service ensures the shipment of high quality produce and enhances Georgia’s reputation as a supplier of superior agricultural products. GA FSIS performs voluntary and/or compulsory inspections of products grown and/or marketed in the state of Georgia, as well as traded in the interstate commerce arena. We also inspect products that are imported into the U.S. such as onions, peanuts, and melons. These inspections determine grade, size, quality, and net weight and are certified on Federal or Federal-State certificates. GA FSIS offers audit verification through the USDA's GAP&GHP Audit Verification Program which is a voluntary, fee for service program. Audits are only performed by USDA trained and licensed Federal or State department of agriculture employees. USDA AMS Fresh Products Branch works in cooperation with States to ensure program integrity, uniformity, and consistency nationwide. USDA trained and licensed auditors provide an unbiased review of growers, handlers, or receiver’s practices to minimize food safety hazards. This program verifies that the participating companies are conforming to generally accepted agricultural best practices. This program is not a regulatory or mandatory audit required by any State or Federal regulation. Passing audit results are posted on USDA’s website and are accessible by you and your customers. In addition, organizations with passing results are acknowledged with an official USDA certificate verifying that the organization passed the applicable elements of the audit. A certificate is issued from USDA to verify your achievement of a passing audit and is suitable for framing. GA FSIS, in addition to providing Inspections Service, also sells equipment necessary for peanut inspection. We have a fully functional and equipped maintenance shop and department that maintains equipment, guaranteeing that it is within the U.S.D.A. regulations required for peanut inspection. To receive a quote on equipment or equipment maintenance, contact Ryan Rigdon by phone at (229) 432-6201 x126 or by email at maint@gafsis.com.